The Romney campaign this afternoon conceded the last state (Florida) in play from Tuesday’s Presidential election. In total, only two states from the McCain Vs. Obama race flipped red from blue in the Electoral College – Indiana and North Carolina. 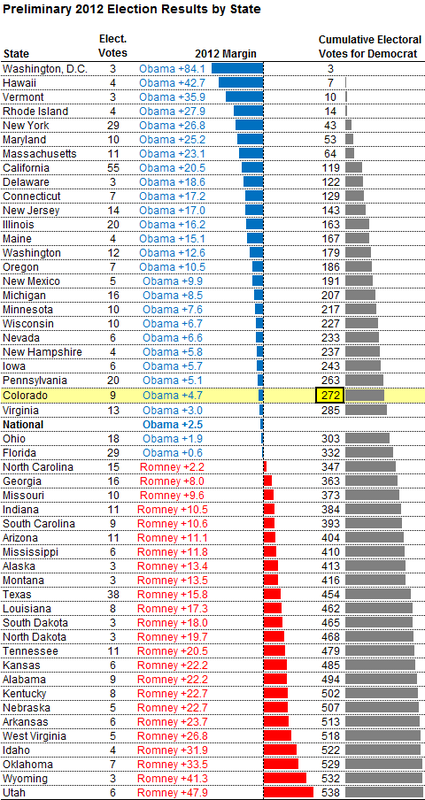 President Obama won the election with a total of 332 ECV to Mitt Romney’s 206 ECV. 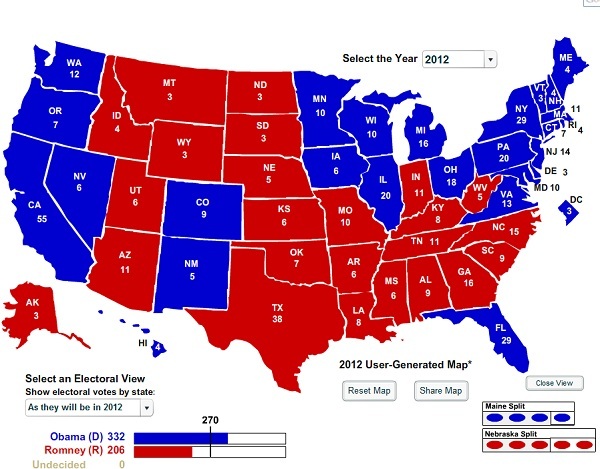 This is certainly different from my final map which narrowly had Romney beating the President. I was surprised and believe the Romney Campaign was surprised as well. Poll assumptions, averages and calculations, most notably by Nate Silver at the New York Times 538 blog had the results more accurately predicted. Larry Sabato over at the University of Virginia also had some successful prognostications. Look at Nate Silver’s Tipping Point Analysis graph – it lays out the work for the GOP in 2016. The same key battleground states in the 2012 race may very well be in play. Of course, Hillary Clinton or New York Governor Cuomo will be the Democratic candidate and the Republicans will also choose another. In order to flip more states red in the Electoral College and win the election, the Republicans must win more votes in Florida, Ohio, Colorado, Nevada, Virginia, Pennsylvania, Iowa, and perhaps Wisconsin. There may be two approaches as noted by Silver and I concur. The Republican Party has a few months to adapt and adopt new messaging to prepare for the 2014 mid-term elections. The data is there and now it is up to the GOP to make the necessary changes.